Horse owners have a saying: “no hoof, no horse.” Foot care is just as important for dogs. 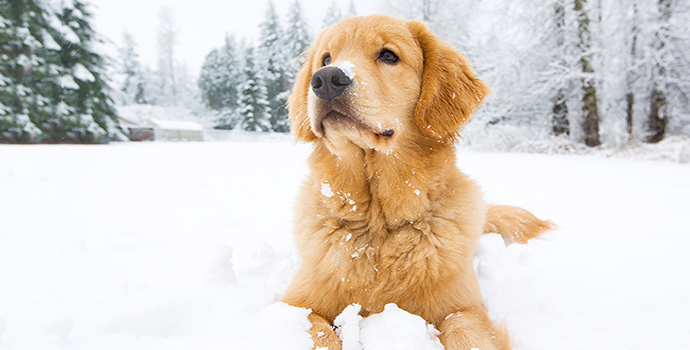 Winter in the northern United States is now upon us, bringing new challenges to keeping paws healthy. But with the proper preparation, you and your dog can find the cold weather invigorating and enjoyable! Fresh snow can bring out the zoomies in even the staidest senior dog – until the dreaded ice balls build up between the toes. Hair on the feet traps snow, body heat melts it, and ice balls form. These can be painful for dogs. Long haired dogs seem to be particularly prone to this problem. I find keeping the feet trimmed helps a great deal. Do not use regular scissors to trim your dog’s feet, especially if you have a wiggly dog. Get blunt edged grooming scissors or purchase a pet hair trimmer and clip the hair between the pads of the feet. I purchased a good quality pair of grooming scissors for this use that have lasted for years. Other options are booties, although some dogs refuse to walk with boots on their feet, or a wax-based product applied to the paws to protect the feet and prevent ice buildup – Musher’s Secret is a very popular brand. I have heard of using solid vegetable oil or petroleum jelly although I have not tried those myself. If you walk on cleared roads or sidewalks you will probably be stepping on rock salt which can be irritating to paw pads. Wipe your dog’s feet when you get home to remove any salt residue, and inspect the pads for cracks or injury. Overgrown toe nails can interfere with the alignment of the toes and feet on the ground, and make it harder for your dog to walk - which is an even bigger problem on slippery footing. If you hear clickity noises when your dog is walking around the kitchen it is time for a nail trim! Despite what your dog may tell you, no dog has ever died from a nail trim and pedicures should be a regular part of your grooming routine. I prefer to use a nail grinder but pick the tool you can use and your dog will tolerate, and commit to keeping toe nails short. And don’t forget your own feet. I have had many a spectacular wipeout on icy streets. Putting some snow grippers (also called ice cleats) on your boots can save you from embarrassment and bruises. I will be the first to admit I don’t always relish winter walks. But with a little preparation and some cold weather gear I usually find it isn’t as bad as I thought it would be, and the joy my dog has playing in the snow makes the cold a little easier to bear. Make sure to keep Terry Naturally Animal Health Joint & Hip Formula on hand to keep joints healthy and relieve occasional stiffness so your dog can enjoy their exercise – no matter the weather! Jennifer Hansgate is currently owned by a Leonberger, a mastiff, a cat, and two tanks of fish. She has spent years dabbling in dog sports including rally, agility, drafting, and tracking. When not in the Terry Naturally office she can be found with her dogs in the many area dog parks and dog-friendly trails. She is delighted to combine her professional responsibilities and her personal interests through contributions to the Terry Naturally Animal Health website.